Wonderfall XL is ideal for window and floor displays, church productions and theater, and events of all kinds. 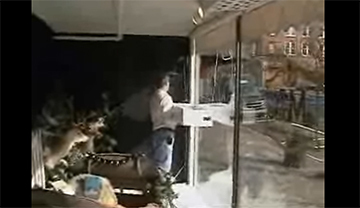 For windows and floor displays, the snowfall lasts up to 8+ hours and it’s totally silent! You also have multiple confetti options for snow and confetti shapes and colors, such as pink flower petals and orange, red and yellow fall leaves. At Wonderfall, we use carefully chosen materials for the most realistic snow and confetti falling effects. Our snow is a translucent shredded plastic flake that floats down just like real snow and it’s re-usable! Our tissue flower petals and fall leaves float in the air and gently fall wave-like down to create a beautiful atmosphere over any event. Wonderfall XL is not a big and bulky machine; it’s sleak, lightweight, and designed to be effective, durable, and affordable. “We’ve been selling this machine for over 20 years now and some of our original customers are still using it! ” says owner and inventor, Tim Pickens. For theatrical use, Wonderfall XL is adjustable so snowfall effects can be soft and gentle or more like a snow storm. There are also two snow matierial choices: a shredded plastic flake, very realistic, or a white tissue flake that reflects light more. Depending on your setting, snowfall effects using our snow will last up to 8 hours. Because Wonderfall XL weighs just 3 pounds, it’s designed to mount in minutes using built-in mounting attachments. Once mounted, plug Wonderfall XL into a dimmer panel or outlet, or use our remote control for easy on/off control. Wonderfall XL is often linked in a daisy chain style with other XL machines so all machines are can be turned on and off at the exact same time. Wonderfall XL is ready to go right out of the box and its’ everything you need to inspire and amaze your friends and customers. People always want to know how our snow machine works. Our patented design uses gentle agitation under the snow or confetti until gravity takesover and the snow or confetti gently releases from holes on the bottom of the machine. No liquids are involved! Plug-in and un-plug for on and off operation or you can use our remote control (sold seperately) good for up to 100 feet. Wonderfall XL stays perfectly still during operation, is totally silent, and installs easily using the built-in mounting rings. Stored properly, Wonderfall XL will last for years to come. Design services available. If you’re looking for a clean and easy way to bring your window display to life, then you’ve definitely found the right product! Whether your production is on Broadway or just off Main Street, we can help bring your show to life without breaking the bank! Here's Some Pictures from Our Customers! The Maze in Americus, GA started using our snow machine about 10 years ago. In this pic he uses our pulley system to lower the machines. Every year people come to see Chuck’s snowing window displays, and many get inside the window for pictures! Bring the crowds to your storefronts and window displays with these very easy to install Wonderfall XL displays. Why let your competition reap all the benefits? Seasons of Williamsburg had a great corner location to show their snowing display. Your windows can look just as amazing for a mere fraction of the cost of the top of the line snow and confetti machines. Look like the “Big Boys” without paying the big price tag.